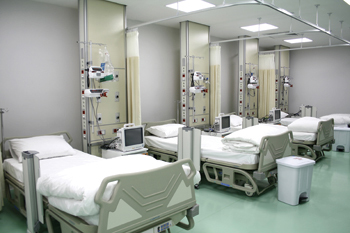 A hospital ward painted with a Hygio system. A new range of high-performance, ‘eco-active’ paints called Hygio, designed specifically for healthcare environments, has been developed by Soframap, the first independent French paint manufacturer. The products are the result of intensive research, says the company, which is a division of the Allios group. The range comprises two products: Hygiopur, an antibacterial paint intended primarily for hospital areas; and Hygio’air, an air purifying paint for all living spaces. It is particularly suitable for health institutions, such as hospitals, clinics and medical laboratories; medical environments; and all premises where transmission of bacteria can occur through contact such as dining rooms, kitchens, childcare centres, toilets, waiting rooms, treatment rooms and lobbies. “This major innovation is the result of many years of research, certified by external bacteriological research laboratories tests,” he adds. • It has a standardised Ecolabel ‘Hygiene Santé Environnement’ (for health, safety and environment) and a FDES (environmental and health declaration sheet) to fit perfectly into the one-approach HEQ (High Environmental Quality). Hygiopur is available in white and pastel shades and packed in four and 10-litre containers. Based on acrylic resin water-based paint, Hygio’air is suitable for use as a general interior finish. However, it is more than just a decorative paint; it serves a new function by ensuring the protection and comfort of the applicators and occupants, the spokesman points out. The spokesman adds that the sources of indoor air pollution are numerous. Items such as formaldehydes, used in construction materials, furniture, cleaning products, furnishing textiles, and adhesives, may emit hazardous substances. Other sources of pollution are food cooking and smoke. “Formaldehydes have a harmful impact on health and can cause irritation, allergies, breathing difficulties, etc. They have been classified as carcinogens by the World Health Organisation (WHO) and the International Agency for Research on Cancer (IARC). They are also said to be one of the most serious pollutants in homes, because of their toxicity and multiple sources,” he says. “Hygio’air is an innovative, high-quality paint that purifies indoor air by absorbing and transforming the formaldehyde particles. It contains an active substance that blocks, captures and converts up to 84 per cent of the formaldehyde molecules into water vapour,” explains the spokesman. The paint, he adds, cleans indoor air in a sustainable manner, with its effectiveness lasting from eight to 20 years. Hygio’air paint was subjected to intensive tests at Tera Environment – a laboratory in France renowned for its indoor air quality tests – which has certified the effectiveness of the product, says the spokesman. Hygio’air has been categorised as ‘Class One’ for its resistance to wet abrasion; it can easily withstand multiple cleaning sessions. It is also ranked ‘A-plus’ for indoor air emissions, and is certified HEQ for being friendly to the environment and the health of applicators and occupants. Hygio’air is available in matt or velvety finish, and the white and pastel shades of the Decocolor Fantasia colour chart. Soframap develops, manufactures and supplies a full range of decorative or technical paints and coatings that combine environment friendliness and performance for the building sector.